PART I. INTRODUCTION TO ECONOMICS. 1. The Art and Science of Economic Analysis. 2. Some Tools of Economic Analysis. 3. Demand and Supply Analysis. 4. Economic Decision Makers. PART II. FUNDAMENTALS OF MACROECONOMICS. 5. 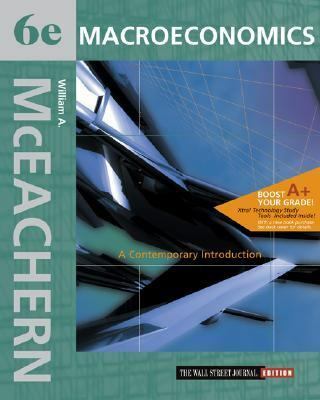 Introduction to Macroeconomics. 6. Productivity and Growth. 7. Measuring Economic Aggregates and the Circular Flow of Income. 8. Unemployment and Inflation. 9. Aggregate Expenditure Components. 10. Aggregate Expenditure and Aggregate Demand. 11. Aggregate Supply. PART III. FISCAL AND MONETARY POLICY. 12. Fiscal Policy. 13. Money and the Financial System. 14. Banking and the Money Supply. 15. Monetary Theory and Policy. 16. The Policy Debate: Active or Passive. 17. Federal Budgets and Public Policy. PART IV. INTERNATIONAL MACROECONOMICS. 18. International Finance.McEachern, William A. is the author of 'Macroeconomics With Infotrac A Contemporary Introduction' with ISBN 9780324072921 and ISBN 0324072929.